Usually basketball for us Murray State fans is over by now. 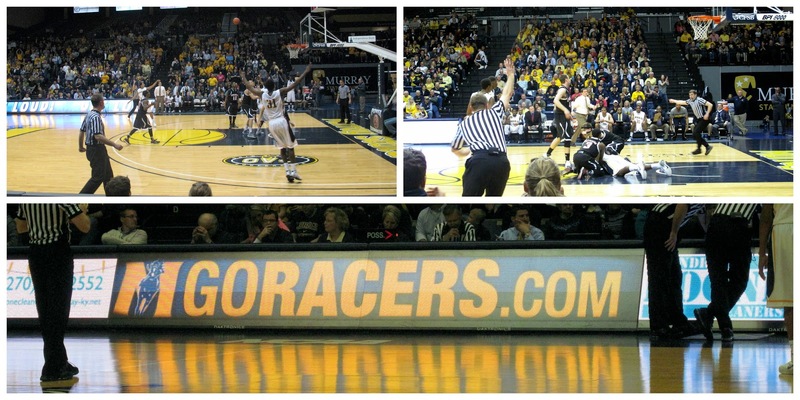 Even if the Racers make the NCAA Tournament, they’ve never made it out of the first weekend. That’s part of cheering for a mid-major team that only can make The Tournament by winning the conference tournament. This year’s Racers were a fun surprise. We went into the season thinking we’d be watching a rebuilding year. And we were, but then mid-way through the season something changed. The Racers were winning and having fun doing it. They played as a team. They smiled often. They don’t seem cocky and self-absorbed. Then Murray State accepted an invitation to play in the CollegeInsider.com Postseason Tournament. I know, I know. Until this season I’ve made fun of every postseason tournament that isn’t the NCAA Tournament. To me, the CIT has been one of many tournaments for the teams that couldn’t make The Tournament. And then this favorite team of mine won its first game in the CIT on the road and hosted its second game. Yes, we were there, decked out in navy and gold, cheering for our Racers, who won. Game Three is tonight in Murray, and we’ll be there again. Yes, it’s still a tournament for teams that didn’t make The Tournament. But one of those teams is my team. And they’re fun to watch. It’s technically a rebuilding year, so it’s a good chance for these younger guys to get in some real-game experience. Plus us fans to get keep watching basketball. NCAA Tournament side note :: I was born and raised a Kentucky fan, so I still cheer for the Wildcats. They’re still playing in The Tournament too. In fact, the Wildcats are going to play their biggest rival in what’s sure to be a dramatic game on Friday night. Admittedly, the Racers have become my first basketball love, but Kentucky isn’t far behind. Who do you cheer for in all this March Madness?